I hope you're not getting tired of all the BEA recap posts. If so, I apologize. I am trying to mix things up a bit over the next week or so with highlight posts and reviews. Please bear with me! Tuesday was the first "real" day of BEA. Kathy and I headed over to Javits Center bright and early so we could pick up our badges and get a place in line for the Children's Book and Author Breakfast. I have attended the Children's breakfast for three years now and I have never been disappointed with it. This year's authors were especially stellar. In addition to the four scheduled speakers, Katherine Paterson, one of my very favorite middle grade authors, was the guest speaker. I felt honored just to be in her presence -- she is like a rock star to me. She is just an amazing writer and an amazing woman! The other authors were also great! Julianne Moore, Caldecott Medal winner Brian Selznick, Sarah Dessen, and Kevin Henkes all were great speakers and I can't wait to read their new books! We did receive a few of their books including WONDERSTRUCK, and I managed to score an adorable Freckleface Strawberry print thanks to Kathy as well as a few great books. If you'd like to read more about the breakfast, here's a link to the Publishers Weekly article. One of my Tuesday highlights was the annual hot dog cart lunch with Stephanie, Beth Fish Reads, Dawn, & Kathy.) As much as I love BEA and the books, the real fun of the week is getting together with my blogging friends and just catching-up! Later in the day, I attended the Young Adult Buzz Panel. It was so hot and so crowded that I ended up sitting down on the floor in the very back of the room. I was very interested in a couple of the books, but I am starting to wonder if the "popular" YA books really appeal to me. You can read more about the five YA titles that were presented here. I was a little disappointed that none of the books were available after the panel, but not so much that I was willing to join in the total chaos that ensued when a few attendees tore open the boxes and began grabbing books. After the YA Buzz Panel, I moved across the hall to the Hot Book Club Titles. I am in a few book clubs myself and I am always on the look-out for good book club recommendations. (And if you've noticed, I link to the reading guides and discuss some of the major themes for almost every book I review!) This was probably my favorite panel because every single book looked interesting to me, and I had only read a few of them. Needless to say, my wishlist grew a lot as a result of this presentation. I even kept the handout with all of the titles listed and I am personally challenging myself to read as many of them as I possibly can. I'm hoping to share some of these titles with you in the next week or so as part of my Book Club Exchange feature, but we'll see -- life seems to be getting more and more chaotic as the school year approaches. Kathy and I then headed back to our hotel to freshen up a bit -- goodness knows I needed it. (I can't believe how awful I look in some of the pictures floating around the blogosphere!) And then it was off to the Apple Store in Soho to see three big-time authors -- Brad Meltzer, Michael Koryta and David Baldacci. Is that an incredible lineup, or what? I had a great time hearing them speak and I became excited about all three of their new books. But what's new? Every single time I "meet" an author and hear him or her talk about a book, I want to read it! We weren't able to stay the entire time because we had to go next door to meet Beth Hoffman, author of SAVING CEECEE HONEYCUTT, and some fellow bloggers for dinner!!!! We ate at The Mercer Kitchen and it was definitely a very cool restaurant. Beth is just an amazing person and I can't even begin to express how generous she is. She is warm and gracious and had all of us in tears when she shared how much each of us meant to her. She also gave each one of us a little goodie bag filled with a beautiful bookmark and a notepad which says "What Would Oletta Say?" Too cute! I am so grateful to Beth for this very memorable evening! After our delightful dinner, it was back to our hotel. I think Kathy and I were both ready to call it a day! We were exhausted (yet hyper) and we couldn't stop talking about all the excitement from our second day of BEA! I think I will have to come over from New Zealand for this next year,it sounds mindblowing! What a fantastic day! And can I just say this: You could never look bad. In any photograph. I agree with Beth K -- you are so photogenic -- your natural beauty always shines. Great recap. There is always so much going on at BEA and so much book and author excitement. 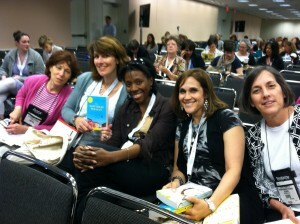 It's amazing how no two bloggers had the same experience at BEA, which makes these recaps SO much fun to read! You had an incredible Day 2 and met some TERRIFIC authors!! *I'm having trouble commenting today...hope this one sticks. I loved meeting you all for dinner; it was like a pajama party! Such fun. And I also really enjoy reading all the blog posts about your adventures at BEA. I don't know what I'm more jealous of, time spent with authors or time spent with fellow bloggers. I'm so glad you all had such a wonderful time. I love the BEA recaps! You were so much fun to hang out with and I had a fabulous time! I'm definitely not tired of BEA recaps and I'm super excited that Brian Selznick has a new book coming out! Re-living this all while reading your post! What a whirlwind week ... looking forward to doing it all again in 2012. Sounds so great. Enjoy all the pictures, you all look great btw! Great post - it is fun to read what else was happening in New York during BEA week... so many events! Beth is such a delight! What a great evening! I wasn't able to attend this year, so I really am enjoying all your recap posts!